This time of year naturally leads you to reflect upon the previous 12 months and what the future holds. 2013 has been a very exciting time for the Pregnancy Sickness Support (PSS) charity. Factors such as increasing the number of registered volunteers within the Supporters Network, attending the Royal College of Midwives (RCM) Conference and setting up a dedicated Online Support Forum have helped PSS to go from strength to strength. My personal involvement within the charity has increased throughout 2013 and I am extremely proud of my achievements. 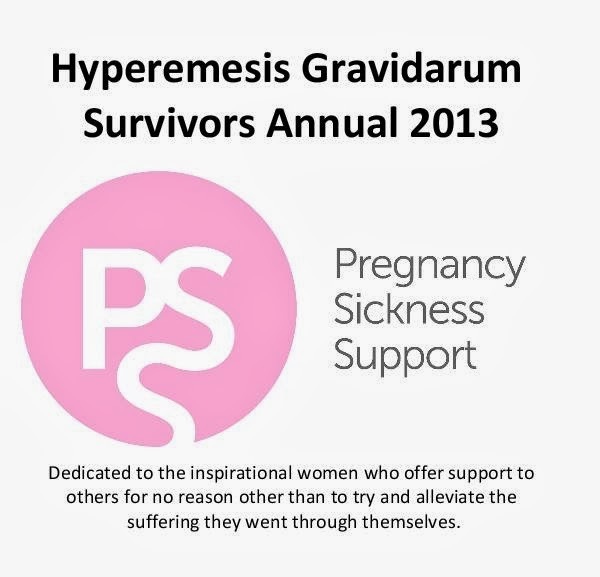 In May I created a video for the International Hyperemesis Gravidarum Awareness Day. I felt privileged to be contacted by so many strong women who all suffered from Hyperemesis Gravidarum. They each told me their HG story and the battles they went through on a daily basis in order to bring their children into the world. Many tears were shed during the making of the video. It was the first time I saw what a HG sufferer looked like from the outside – what my family saw in me every day of my pregnancy. The hollow eyes, the colourless face, the bruises from the IV fluids and the desperation for the nausea and vomiting to end. I was overwhelmed with the positive response of the awareness video and hope that it helped shine a little more light on this relatively unknown condition. When I was pregnant I would spend hours trawling the internet to find photos of HG survivors. I desperately needed to know that there would actually be a baby at the end of the ordeal! Reading survivors’ blogs gave me hope and got me through some very dark days and nights. As a result of the Awareness Day video I created the first ever PSS HG survivors annual. 44 families participated in the publication and it celebrates the positive outcome of the condition. Through the book I was lucky enough to get to know fellow sufferers and have met many as a result. Looking forwards into 2014, it isn’t many months until my Yorkshire 3 Peaks challenge. I have been using the Christmas break to do further research into what the challenge entails. Through reading other people’s blogs I was surprised just how many people have given up. Whether it was through bad weather, ill fitting equipment, bad physical preparation or ‘hitting the wall,’ people couldn’t complete the challenge in the allotted 12 hours. I suppose being forewarned is forearmed. As a result I have made alterations to my training schedule so that these factors will not impede me on the challenge. Quitting or not completing is not an option. Already this challenge shows similarities to my HG journey. After HG you realise just how much you can push your body and mind to achieve something you really want to. It has taught me that I am stronger than I give myself credit for and that with the support of my immediate family I can succeed. So here is to an exciting and challenging 2014! Happy New Year from all of the Nine Months Of team.